"I look back so positively on that time of my life is because of the care I received from Marcy"
My name is Tricia and I am a mother of two young boys (ages 2.5 and 5.5) in NYC, both born at home, each of them the day after Thanksgiving, practically in the same spot, almost exactly three years apart!!! Marcy was my home birth midwife for both of these births. My first labor was 36 hours and my second was only four. I feel certain that a huge part of why I look back so positively on that time of my life is because of the care I received from Marcy during my pregnancies, during the labors and the guidance she provided afterwards as well. She listened to me, respected my desires, offered really fair advice and offered all the options. During my labors, there were times I felt I would not be able to go on or progress…she never rushed me or was afraid. She was calm, assured, positive and firm. She is serious, supremely knowledgable and instinctive. We trusted her completely. We knew we were in good hands and we were. I feel so grateful for her patience, for helping me to find my strength and to support me in what was the most challenging (but rewarding) experiences in my whole life. I have zero hesitations recommending Marcy to any expectant mother. She has become a trusted friend and supporter and I love her as a pivotal person in my life! These photos were taken immediately after he was born! The way a newborn is weighed! I got to eat a delicious Thanksgiving leftovers sandwich! This photo was taken probably a minute after Holden was born. It is amazing to me that after what is the most difficult moment of your life pushing your baby out the second he is out you feel totally fine and as if nothing hard had ever happened!!! The Women of Ginger Moon - " Marcy Tardio, CNM: Honoring 25 Years of Midwifery"
I knew I had made the right decision to hire Marcy as my midwife when, at her first visit – all of which were in my home – she took time to ask me about whether I had a history of physical or sexual abuse in order to work within my personal needs and boundaries during the pelvic exam. The exam she began by requesting that I choose a lubricant of choice (olive oil, or whatever you normally use) and a place where I felt most comfortable. I have never felt more at ease and respected by a practitioner in my life. In this photo, Marcy is administering the APGAR test while newborn Haydée is kept warm, not by an incubator, but by her Papa’s warm and loving arms. On the right you can see my son’s little hand resting on my leg; Marcy is telling him that he was a fabulous Midwife’s Assistant. The moment he arrived home from school, she welcomed him and allowed him the space to take part in his mother’s labor as much as he needed to. He has since told me that the two hours he spent being the Contraction Timer Man and massaging my back and legs made him feel so important and special – exactly how I hoped he would feel about the birth of his sister. This is the essence of what Marcy brings to families: she empowered each of us to be present exactly how we were called to be, and as a result this birth was the day that we re-birthed ourselves into a new family, together. When I chose to do a homebirth for my second child, I knew that I wanted to use Marcy as my midwife: she has over 25 years experience, I heard that she was amazing and loving, and she had superb recommendations and was willing to travel to the Bronx, where she was born and raised. Marcy was very supportive of having the me having the proper support during my birth. During my labor, Marcy her assistant Loretta, my doulaMaiysha, my sister friend Maricruz and my partner Omar where present. My two year old son Gibran was asleep, but when he awoke, he was welcomed as an integral part of the support circle! While I have the day present in my memory and my heart, it is really through looking at my beautiful birth pictures that I can honestly appreciate the love, tenderness and care that Marcy took in ensuring that my birth space was sacred. Through the pictures there is a sense of calmness, love, tranquility and such serene feel to it. While I remember the physical and mental space that I was in, I also remember that Marcy created a whole space as a temple to honor me. My postpartum visits where very similar. So fresh in my mind, they remind me of two girlfriends leisurely catching up on the bed with a new baby in the mix (and yes my two year old joined in all the visits, where Marcy made sure he felt he had an important role to play). This feeling of friendship, sisterhood and support did not end with the birth of my daughter. About a month after my birth, I mentioned to Marcy via text message the need that I have to go dancing. Within minutes I received “I’ll be at Salsa Mania at Dancesport Studio today 5pm-9pm”. Wow, I thought – the support continues! Marcy was an outstanding midwife. The pregnancy of my daughter was a challenging period of my life. Physically I was in great shape, but the circumstances surrounding the pregnancy were complicated. I chose to have a home birth because I wanted to birth in a mother-centered supportive environment void of hospital protocols and unnecessary interventions. I chose to birth with Marcy because from the beginning her treatment and regard were much like that of a close relative. In her presence and under her care I felt totally supported, empowered and, I have to say, loved.This was exactly what I needed at the time. Whenever I needed a resource to support my well being she provided a referral to an excellent practitioner. From my doula, to childbirth classes, yoga therapist, naturopath, herbalist, and more. The beautiful thing is that her respect and regard as our midwife extended to my entire family, and at that moment in our lives we needed practitioners that would support our development as a new family. Marcy stepped into that role with grace and ease. Marcy and her Birth Assistant, Loretta, with Maricruz, her son Omar (age 9) and newborn Amari Nur, moments after birth. During my birth I wanted to be surrounded by people who would remind me, “You got this!” when I reached the point when I was convinced I could not go on. On the day of the birth, under Marcy’s and her assistant (and my doula) Loretta’s guidance my sister Sylvia, my friend, kindred spirit and business partner Janvieve and the baby’s grandmother maintained a safe and supportive space where I was empowered to birth. Although my daughter’s father was out of town, with the support of this amazing circle of women, I never experience anything missing! The amazing thing was that Marcy was not there to deliver my baby but rather to reassure me, and everyone else, that I had everything I needed to deliver my baby. Inside this amazing space I was empowered to successfully cross the wall of fire every woman goes through when bringing life forth. It was the most amazing, self assuring and empowering experience of my life. "We can’t recommend Marcy highly enough!" We can’t recommend Marcy highly enough! She is a knowledgable, warm and engaged practitioner, and a smart and calm clinician. She comes to your apartment for all prenatal appointments, which is a wonderful privilege, considering the state of healthcare in this country, and she was always available when we had questions. I had a very long labor (around 36 hours), and I never felt unsure or worried, even when I became dehydrated and had to have an IV of electrolytes strung up on a coat hanger above the bed. Marcy stayed with us all night as I regained my strength and went through transition, and by the time I was ready to push I felt rested, upbeat and calm. We joked that it was a very “medical” home birth, but, of course, it was a great example of how medical intervention can be incredibly important, and that, when having a homebirth with a practitioner like Marcy, you only have intervention when it’s actually necessary. "She was so gentle and loving, yet firm and secure and strong..."
I've recommended Marcy to a few friends that ended up using her and everyone absolutely adores her. I can't imagine having a better mid-wife. She was so gentle and loving, yet firm and secure and strong. We wish that we could have used her for the birth of our second daughter, but we were living in Los Angeles. Jen had back labor and Marcy was able to flip the baby using a long cloth. It was amazing! We had such an incredible first birth experience. It was absolutely beautiful. "With Marcy at a birth, I feel safe..."
With Marcy at a birth, I feel safe. As a doula, before we can help make this empowering experience, we have to safely guide the mom & baby to the other side. When I work with Marcy, I know she knows her clinical side so well, I'm free to do my job better and just focus on the emotional & physical side if the birth. I've known Marcy all my life. She's a huge chunk of the reason why I do this work. I remember hearing birth stories from her as a child and being so excited to be in that much proximity to a birth. Once as a teen I baby sat for her when she was on-call. I was so excited to be even that close to a birth. But I kept that excitement to myself for years. I just thought that everyone wanted to be at births. I didn't realize that it was a unique passion to be drawn to births. Marcy was the person who kept calling me back, she saw and understood my calling and finally convinced me to jump into it full-time. I love & respect her ancient woman's wisdom, hand-in-hand with modern medical care & safety. "Marcy is a soulful, kind and a very strong woman..."
Marcy is a soulful, kind and a very strong woman whom I felt I could trust immediately after our first meeting. She made me feel confident about her abilities as a midwife and also I knew that she would know exactly what to do if anything unexpected happened during labor. She was very good at scheduling our meetings and very present throughout the journey. Her long time experience really also speaks about her hands on experience. She was always available for phone calls and had really good knowledge if I had any concerns or questions along the way. She came to our house for each examination and made it very comfortable and efficient time wise and would always make sure our expectations were met. She is extremely nice and really professional. I recommend Marcy as a midwife very, very, very, strongly, she is a compassionate and extremely strong and grounded woman, and my experience with her was unique and good. At the birth, she helped me focus my energy and told me exactly what I needed to hear to help me go through the pain and helped me through my contractions, which were very fast. I was overwhelmed by this energy and she was really focused and present and that helped me take control over the labor and birth. Also, the follow up the day after the birth was really good and helpful. 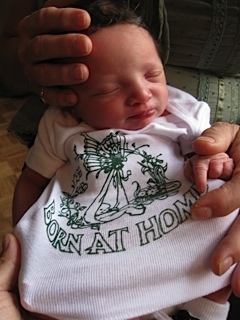 Everything went so well with my home birth with Marcy, she is absolutely terrific. Our baby girl Melody is happy, healthy and the recovery at home with her made it very easy and convenient to heal and move forward in a known environment, safe and familiar.